The politician’s election team believes "there cannot be any talks of exchanging Crimea for peace in the Donbass Region"
KIEV, April 15. /TASS/. Presidential hopeful Vladimir Zelensky is not considering raising the economic blockade imposed on the territories over which Kiev is not exercising control or recognition of the Russian Crimea in exchange for peaceful resolution of the armed conflict in the Eastern Ukraine, the politician’s election team said on Monday. 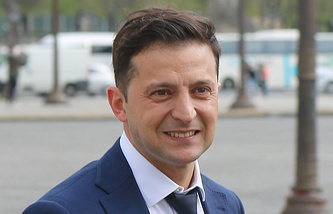 "The issue of lifting the economic blockade imposed on the temporarily occupied territories cannot be considered," Zelensky’s team said. According to them, "there cannot be any talks of exchanging Crimea for peace in the Donbass Region." "Secession of any territories or regions of Ukraine cannot be discussed just as well," they underlined. "Crimea was, is and will be a part of Ukraine which should be returned, while Russia has to pay a compensation for the damages inflicted by the occupation as well as reparations to those who suffered from Russian repressions and their families," the statement reads. At the same time, the team expressed willingness to hold talks with Russia. "Our official representatives will have to talk with the Russian authorities. But these negotiations will be held with the participation of our Western partners and under no circumstances will we speak with them on the occupied territories of our country," the statement points out. 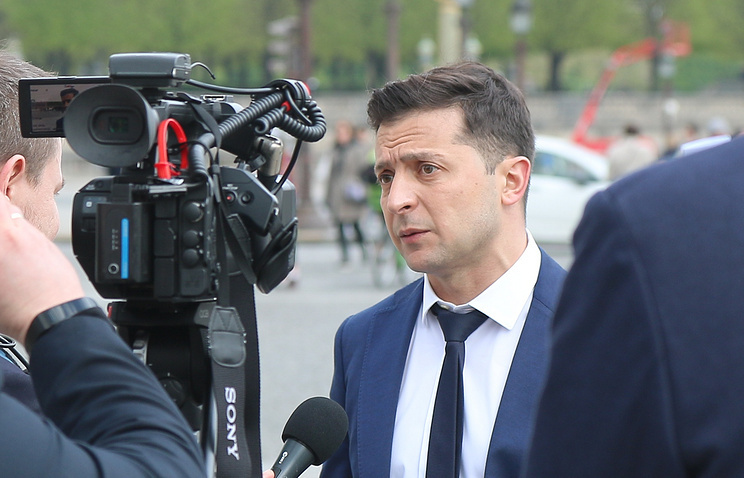 Earlier, Zelensky himself said that he is willing to negotiate with anyone so that people are no longer dying. At the same time, he said he is ready to compromise. "What do you want? Your conditions? These points should be put down. Then I’d take them and say, here are our conditions. And we’d meet each other somewhere in the middle," he said in one of the recent interviews. After the coup d'etat in Ukraine in February 2014, Crimea and Sevastopol officials held a referendum, in which 96.77% of Crimeans and 95.6% of Sevastopol voters chose to secede from Ukraine and join Russia. Eighty percent of the voting population participated in the referendum. Russian President Vladimir Putin signed the reunification deal on March 18, 2014, which the Federation Council (upper house of the Russian parliament) ratified on March 21, 2014. Despite the convincing results of the referendum, Kiev refused to recognize Crimea as a part of Russia. In mid-April 2014 Kiev launched a military offensive in the East of the country, where the predominately Russian population refused to submit to the new authorities. Mass shelling of residential quarters, including the use of aviation, resulted in a large-scale humanitarian catastrophe. Simultaneously, Kiev imposed a full economic blockade on Crimea, as well as the Donbass Region.